Tomorrow, May 7th is National Home Brew Day! Brewers across the country will be celebrating by doing what they do best, brewing beer of course! There’s events planned all over at the county at craft beer bars, home brewing shops and even aboard ships where home brewing clubs and individuals are going to be brewing. I’m sure that more than a few delicious home brewed beers will be enjoyed too! The history of National Home Brew dates back to May 7th, 1988 when Congress officially declared the day. The American Homebrewers Association (AHA) created AHA Big Brew as an annual event to celebrate National Homebrew Day around the world. 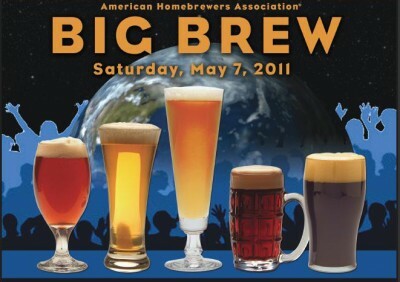 AHA Big Brew is held each year on the first Saturday in May. You can check out this list of events across the country. There’s events where you can join in and brew, meet other home brewers, learn about home brewing and have a pint or two of home brewed beer. You can join in at 1 pm EST with a nationwide toast of home brews. That means that if you’re on the west coast, the toast is at 10 am. A little on the early side, but if you’re already working on your next batch, it’s never to early for a drink. Stay home and brew a batch. You don’t have to go out in public to participate, however you can share the joy of home brewing with a friend for bonus points. I don’t know what I’m doing to celebrate. I currently have a batch that’s tying up my equipments, so I’m probably going to head out to one of the three events here in Tampa, okay four that I would like to go to, but I’m being realistic. There’s only so many hours in the day. I plan on definitely enjoying a home brew or two!